Junior instructor front office assistant 2014 hall ticket (Category No: 527/2012 to 549/2012) is now available at Kerala PSC website. Candidates can download the admission tickets through their one time registration profile in the website www.keralapsc.gov.in. The exam is scheduled to be conducted on 10th July 2014 Thursday from 7.30 PM to 9.15 AM. The preliminarily test consists of an objective type exam (OMR Valuation) based on the qualification prescribed for the post. The Kerala Public Service Commission, one of the largest recruitment agency in India has finalized the works for conducting the Junior instructor front office assistant in industrial training exam 2014. The exam is scheduled to be held on 10th July 2014 Thursday from 7.30 PM to 9.15 AM. The preliminarily test consists of an objective type exam (OMR Valuation) based on the qualification prescribed for the post. The exam duration will be 1 hour 15 minutes with maximum marks 100. Divided into 2 parts, the main topics for the exam are technical syllabus, General Knowledge, Current Affairs & Renaissance in Kerala. 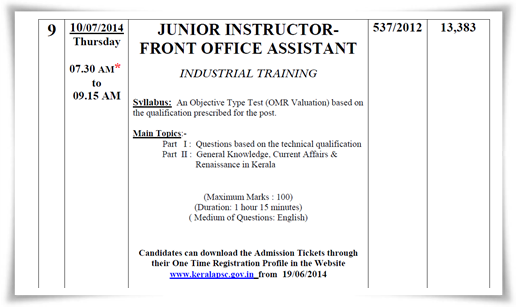 The Junior Instructor qualifying test will be conducted on 10th June 2014 for Category No: 527/2012 to 549/2012 to fill vacancies for 23 trades. With a scale pay of 13,900 - 24,040/, the number of vacancies calculated is 169. 13,383 applicants have submitted applications through the one time registration. The duration of exam will be 1.45 hours which include the verification of documents. The list of selected candidates published by the Commission shall remain in force for a minimum period of one year. It is very important to give full dedication to the learning process in order to enter the top rank list. As syllabus is the king, candidates should have to focus on the detailed course outline and also put complete effort to get mastery over the subject. Collecting as much previous question papers and taking online mock tests would build up more confidence also to gather knowledge about the blueprint of questions. It is highly recommended to form study groups and utilize the time to discuss topics related to the exam syllabus. Through a strategic learning, one can get to the top rank list. Candidates who have applied for the post can download the admission tickets through their one time registration profile in the website www.keralapsc.gov.in. Kerala PSC village extension officer exam (VEO) 2014 hall ticket for Thiruvananthapuram, Kottayam, Idukki, Wayanad and Kannur districts is now available at PSC website. Meanwhile the admission ticket for Kollam, Alappuzha, Thrissur,Malapuram, Kasargod to be available from 31st May 2014. The exam for these districts is set for 21st June. Candidates from Ernakulam, Pathanamthitta, Palakad, Kozhikode districts can download the hall tickets from 16th June for the exam scheduled for 5th July 2014. Kerala PSC Process Server/ Duffedar/Courtkeeper Hall Tickets (375/2012) will be issued from 21st June 2014. The exam is scheduled to be conducted on 12th July 2014 Friday from 10.30 AM to 12.15 PM. Candidates can download the hall tickets from the official website of Kerala PSC. The preliminarily test consists of an objective type exam (OMR Valuation) based on the qualification prescribed for the post. Read more to know about the syllabus and exam details of Kerala PSC Process Server. Kerala PSC Draftsman Grade I (Civil) exam 2014 hall tickets category no (655/2012) can be downloaded from 3rd June. The exam is scheduled to be conducted on 24th June 2014 Tuesday from 07.30 AM to 09.15 AM. Candidates those who had applied for the exam can download the hall tickets from the official website of Kerala PSC. The preliminarily test consists of an objective type exam (OMR Valuation) based on the qualification prescribed for the post.